When driving on the roads of New Zealand it is an appealing fantasy to imagine the land as it once was, unpeopled, forested, primeval. Every now and then, on depressingly short sections of the highway―two that are lodged in my mind are the road to Dawson Falls, and the route over the hill behind Tokaanu―this fantasy comes to life; roll down the windows and that dense, earth-laden, green-tinged air rushes in and tastes like the world before civilisation. This is a fantasy that the paintings of Mark Wooller indulge. Their subject is ostensibly the New Zealand bush, and it is simultaneously identifiable and imagined. Individual specimens of kauri, totara and ponga can be seen amongst a broad palette of green, which deftly replicates the combination of wilderness and patternation that distinguishes the bush, with its sub-tropical make-up of half-jungle and half-forest. With a multitude of small, definite brushstrokes Wooller recreates and invokes the vista of bush-covered hills, the foliage smooth and shiny, the overall effect almost furry in its lushness. Fantasy is at both the surface and the core of Wooller’s paintings. This is not a fantasy stemming from imagination or myth, but one based on and applied to history and reality. The greenery that he paints is gorgeous, pelt-like, invented, yet still identifiable as the New Zealand bush. Amongst the bush Wooller maps out roads and streets using mere parallel lines, yet he identifies them as the routes we use every day. Along the streets he draws buildings, which are loose interpretations of standard industrial warehouses, of different heights and varying architectural sense. Rivers are ribbons of flat blue paint that intersect the green vegetation. Sections of land located in the city and suburbs of Auckland are empty plots, neatly cushioned against their neighbours, measured, numbered, the site of our past and future lives. The foundations of these fantastical elements are hand drawn, which contributes to their imprecise nature. On top of these loosely rendered landscapes Wooller places tightly painted detail, creating a remarkable tension between the surface and the foundation of each picture, as if it were a house of cards, with a perfect peak on top of a base that threatens to shift. His painting style is a mirror of his subject, those precise legal documents of land and property deals, perfect constructions that sit atop messy transactions and human interaction. It also mirrors the city the painter depicts, a manicured concrete façade on an earth that has the propensity to rumble and shift. Ultimately it mirrors the act of painting itself, the smearing, moulding and finish of pigment on the rough raw canvas, the initial blankness of which presents, since anything is possible, a serene instability. In amongst the pockets and parcels of bush Wooller plants evidence of human activity, primarily roads and buildings. These are rendered naively, in a contemporary recreation of a colonial painting style. They are hand-drawn marks of his allegiance to early colonial painters. Taranaki Rivers is an homage to Charles Heaphy’s often reproduced Mt Egmont from the Southward (1840), the ridiculously steep slopes of the mountain replicated from a slightly higher point of view, repeating that exaggeration of incline that somehow relates to the real thing when seen from Oeo. Like Heaphy, Wooller centres the mountain in the frame, yet he replaces Heaphy’s watercolours with a lush palette of deep and variegated greens, and he lets streams dance uniformly and illogically towards the sea, as if the mountain were a maypole and the rivers delicate blue ribbons. Eastern Lots, his view of the slopes overlooking the Waitemata Harbour, is painted from a similar point of view of line drawings of early Auckland by John Kinder, updated by the intense colouration of the modern oil palette. Wooller displays a real empathy with New Zealand’s colonial artists. This is not limited to subject matter, and extends to the intent of the painting, that sense of wonder, of promise and optimism that characterises the early artists. Just as the colonials recorded the new world in which they found themselves, and then embellished it, participating in the selling of New Zealand as an optimal destination for British emigrants, Wooller embellishes the known geography, providing fuel for a collective fantasy, painting what might have been, but now could never be. Wooller is a student of history, however, and acknowledges that the settlement of the land he depicts was not always a just and fair process. His recent show at Warwick Henderson Gallery was titled The Lie of the Land, referring to the untruths and exploitation that surround development as much as to the way the land looks. The orderliness of crossroads and street facades is a veneer, and there is a sense that a riotous, despicable, unsavoury city exists behind the representations of its structure. Imposed order and precision cannot repress messy, regenerative, fecund nature. This idea is played out by the juxtaposition of bush and city. Wooller equates the two, and professes his admiration and care for both. He grew up in Te Atatu, and his long-distance views cemented this duality: east to the city, the built world, and west to the Waitakere Ranges, the natural, bush-clad horizon. Painting blocks of bush on Queen Street is no act of guerrilla gardening, but rather the result of an imagined confluence of the important parts of his early life. These pockets of bush on city blocks comment on the destruction of forest, and invite the viewer to consider and care for the natural environment; by placing the bush where it does not exist, he invokes surprise, and draws attention to its absence. He brings to light the devastation of the New Zealand bush by painting it in its lush verdure. Homage in Wooller’s paintings is not limited to colonial painters. He appropriates the waterfall of Colin McCahon and reproduces it repeatedly in Waterfall Collection and magnificently, almost mythically, in Kauri Falls. The homage to McCahon’s Titirangi Cubist works is more subtle in Titirangi Bush Lots, in which he too creates a Cubist version of the Waitakeres, this one a chequerboard of numbers and blocks of bush, each one labelled with a street name from that suburb. The prevalence of crossroads is a mapped homage to McCahon’s use of the religious symbol, an homage made more explicit in Kauri Cross. The tins of Kauri tobacco in this cross constitute a convergence, standing for the tree itself as well as for human activity, the words ‘Fine cut Virginia tobacco’ replaced by place names where kauri once stood. The references to art history are paralleled by the inferences of social, economic and personal history that Wooller creates with his surreal bush landscapes. Each numbered section represents the centre of intense activity―surveying, recording, defining, registering, selling, marketing, advertising, inspecting, buying, planning, building, furnishing, painting, roofing and so on. The cluster of sections within each work presents a collective human history of settlement; each one projects a future home, and the generations and endeavours that will be born there. They are a subdivision of potential, and a mark of faith in humankind and progress. The occasional overlay of a vintage letter, sent to an entirely fictional address, points to the details of the lives that are lived; some of the post is registered, and marked as such by a pencil cross, hinting at the importance of the communication they contain and their role in the process of settlement. These pencil marks echo the crossroads of the city and reiterate the cross as a literal and a conceptual motif, indicating not only the building and laying of roads that function as lines of communication, but also corners turned, directions taken and decisions made. The cross divides the space it occupies into areas of similar size, providing balance, and a foundation for order and for measurement. The act of measurement is core to the development of land, and therefore the ability to record the history that occurs on it. Wooller plays with the trade of surveyors, taking their tools and their vernacular to add layers to his paintings. Rulers are stacked against one another and become an illogical river in Measured River, once again equating the natural with the human, and pointing to the historical role of rivers as roads. He includes words in his paintings, usually references to places, as if they were a building plan. The inclusion of words in this way is another reference to McCahon, but also a foray into the typographical; Wooller makes his writing appear vintage, through a fine process of smudging and overpainting, and he uses words that look right, and sound pleasing when said aloud. The act of naming places is similar to the numbering of sections―it is a way of establishing order, so that wilderness can be tamed. Naming and numbering objects, things and landmarks is evidence of human activity, and central to its history. Commercial Bay (Log Jam) identifies Auckland’s volcanic cones by name, and text on each of the logs afloat in the water indicates another place ―evidence of the source of the tree. These logs float in a watery Purgatory―they are trees destroyed, about to enter a second life as lumber, providing the bones of the colonial body, its houses, shops and bridges. There is an ongoing tension in the paintings of Mark Wooller that is layered and rewardingly complex. The tension is thematic as well as formal, and stems from the dualities of order and chaos, of nature and culture, of wilderness and the city. It is supported by the use of a reduced palette―the deep greens of foliage and the brown hues of roads and rulers―and heightened by the dramatic juxtaposition in each canvas, between bush and its surrounds. The early colonial painters on whom Wooller draws were surveyors, mostly. Wooller casts himself as a modern-day equivalent. The arbitrary boundaries he depicts are more than a mere survey of the land, rather they are the building blocks of the history that has happened on the land since. Like his urban blocks of bush, that history is imagined and as likely to live in fantasy as in truth. The artist encourages us to trust what he has painted, but to use it as a springboard to what we might envisage. Review by T J McNamara, NZ Herald April 27, 2013. Circles and natural forms are part of the work of Mark Wooller. A group of paintings called Crop Circles are in his extensive show at the Warkwick Henderson Gallery. All the works, with one exception, use his established style of painting extensive areas of dense bush made up of large trees packed closely together. The trees are uniformly dark green with touches of red rata berries. The painting is done with minute care. In Crop Circles, an exactly circular area of different and brighter touches of vegetation suggests some sort of ritual intervention. It is an appealing motif with a touch of magic. 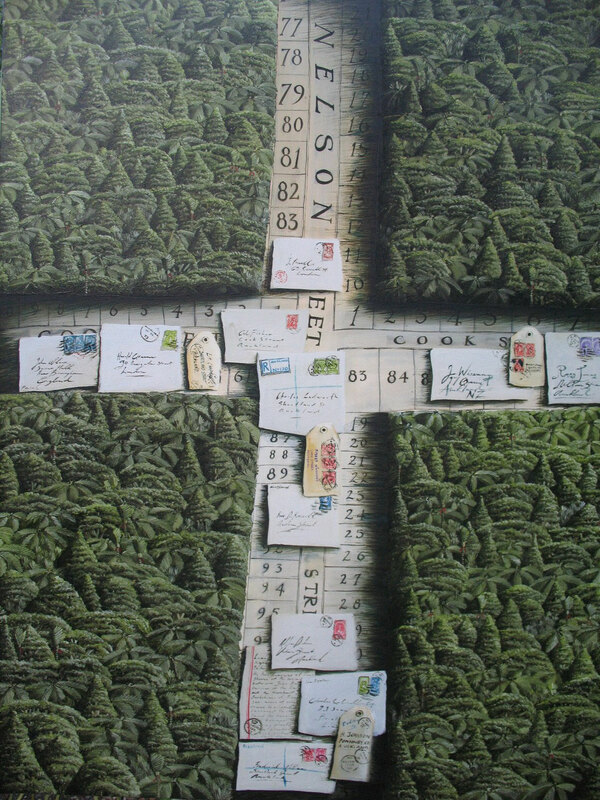 The other pieces are similar to Wooller's previous work where the bush is crossed by intersecting roads with familiar street names, such as Nelson St or Cook St. These evoke pioneering beginnings. The mood is intensified by groups of envelopes, again exactly painted down the stamps and postmarks of correspondence relating to the later inhabitants of these streets. Similarly, some of the dark bush is divided by painting of carpenters' rulers, with the artist especially fond of the brass hinge of the tool. Pioneer building is evoked. One exceptional painting represents the empty land that is to become Auckland dramatically reaching down to the sea like a giant hand tattooed with early surveyors' marking out of sections. It is a potentially useful variation on the artist's milder take on the development of the city's landscape. McNamara – NZ Herald April 25 2011. This is a week for landscapes but none of the artists portray any particular place. They do not depict nature objectively but bring together various impressions to create a scene governed by subjective moods. 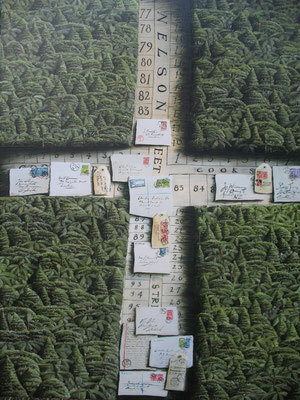 Specific places are mentioned in the work by Mark Wooller at the Warwick Henderson Gallery but they only occur lettered as symbolic names and places and roads. The landscapes are shown as vast tracts of primordial kauri forest – a forest of mythical proportions.These are the basis for a visual meditation on early land transactions in our history. Not that these are any sort of conservationist tract; rather, they fix a moment in time. The principal element is thick dark green canopies of bush with patterns of trees and fern painted with great patience and care. Great trunks of Kauri appear and in the smaller paintings Tane Mahuta himself occupies and central place. The word “kauri” has a ring to it and the vanished kauri forests have a special place in our collective memory. Wooller has emphasised this as part of the still-life that interacts with the green forest that is the soul of the land. In some paintings, notably A Fine Cut, there are exact replicas of tins of a tobacco called Kauri. The contrast between the commercial product and the mighty giant is ironic. The artist’s skill with still-life is put to even better symbolic use in many of the other works. These show pathways and rivers cutting through the density of the bush as well as old calendars and plans. Most effective are the envelopes and other documents, such as deeds, that play an important part in most of the compositions. The envelopes are painted convincingly with hand painted addresses and carefully drawn stamps and postmarks. Some are crossed with blue crayon as registered letters used to be. All are connected with land transactions and supplemented by tags from milling and land-for sale advertisements. was responsible for laying out much of early Auckland. In some of the paintings the dark colour of the course of a meandering stream looks more like bitumen than water – though this may be another deliberate irony. There are places where the whole concept is pushed too hard, notably where the bush does not roll away into the distance but remains flat, even when it supports a stylised mountain. with our history in a visually effective way. Have you ever reached a point where you feel you can’t turn back? Caught by a current of your own creation which steadily draws you downstream? The characteristic form of an eel net pinches at the point of no return – a symbol of focus in Mark Wooller’s contemporary language. Combined with the allegory of the River the poetry of Mark Wooller’s symbolism moves confidently on. The calm manner of Mark Wooller pervades his art. Over more than a decade of exhibiting – both within New Zealand and internationally – Wooller has formed a distinctive visual language. Living off the land and drawing inspiration from the natural world, Wooller presents us with nature stripped back to its outlines and essential forms; a finely detailed net or a leaf in graphic form. The themes in Wooller’s work often grow from single ideas but the results are anything but random. Like the artist’s own poetry - which also provides a starting point for his work - all of the details in a Wooller painting are meticulously placed. Through a subtle and clever use of shadows, Wooller enhances nature’s fundamental qualities. His shadows play up a three dimensionality of the shapes in his work, drawing attention to elements of nature which are often overlooked because they are so familiar. For all of the calmness and serenity though Wooller’s work is not placid. Nature becomes a springboard through which a range of emotions and themes can be examined. Stories thread their way through each canvas and his art achieves a gentle, captivating power. How calm Wooller stays remains to be seen as the artist enjoys increased popularity – in 2007 having exhibited at the Shanghai Art Fair and Australia – Wooller’s nature is transcending boundaries.